Orly Taitz, Esq. and Donald Trump: Legal U.S. Citizens Ask Where’s the B/C and the SS #? 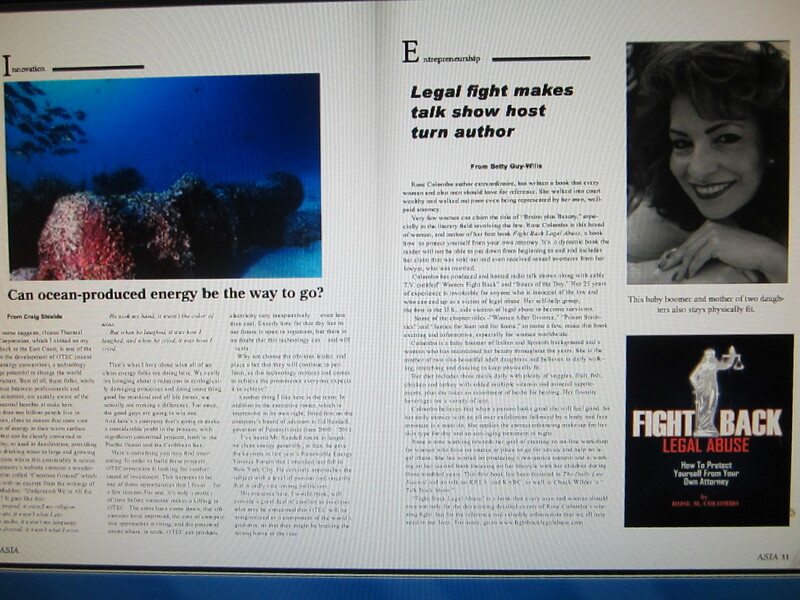 Rose Colombo’s award winning book featured in prestigious worldwide magazine! A valid certified U.S. long form birth certificate is issued to every baby born on U.S. soil. A personal social security number is issued to every U.S. legal and Natural Born citizen in the United States of America and it is required by federal and state laws. Recently, Orly Taitz, Esq. filed a lawsuit alleging that President Obama is using a fake Social Security Number from 1890 that belongs to a Connecticut dead American, so doesn’t President Obama need his own personal social security number in order to work in America and accept compensation from the American people if the allegations are provable and the court finds her evidence to be true? How then shall we explain why President Obama finds it necessary to write a self-serving Executive Order immediately after he was elected as a U.S. President in January 2009, which conceals his personal records from the American people (unless he grants permission) and by-passes Article II of the United States Constitution, while congress looks the other way? Obviously, the question remains of how then can public servants write laws according to the constitution that are self-serving and for self-gain so some public servants can circumvent the laws the land and how is that legal? After all, one way to circumvent and destroy the U.S. Constitution is by Abuse of Power. For example, abusing one’s power by writing a myriad of Executive Orders and Presidential Directives that circumvent every Article of the U.S. Constitution established by our forefathers if the U.S. Congress looks the other way and says or does nothing while the abuses continue is the failure of congress to exercise their power and hold hearings. The intent of allowing the Commander-in-Chief to write Executive Orders is not to by-pass constitutional law, usurp the constitution or circumvent the laws in an attempt to make the constitution nothing more than a “mere charter of negative laws” that will create constitutional change and provide the door to establish foreign laws on U.S. soil which is against the law, but could occur if congress does nothing to prevent the erosion of our laws. Every U.S. legal and U.S. natural-born citizen has a personal social security number issued in their name. Since the late 70s, every baby legally born in the United States of America is required by law to be issued their own personal social security number. In fact, people who do not have legal social security numbers cannot be legally employed by government or by free enterprise. Shall we then assume that members of the U.S. Congress are fearful of their leader or somehow rendered helpless when it comes to demanding the production of his personal records required by Article II and the vetting procedure for 235 years.? Consequently, how is it possible for a person living in the United States of America to take out a foreign student loan and attend Harvard or Columbia universities without a legal U.S. social security number issued since the purchase of school books and tuition is listed on personal tax returns? Every personal social security number issued provides the legal name, social security number, as well as the date and place of birth and their information is recorded and filed with the Department of Social Security. Therefore, the majority of Americans are raising their eyebrows and demanding to know how can a man, whose father is Kenyan born and a subject of Britain, be improperly vetted? How is it that the President of the United States has dodged the lawsuits filed against him with evidence attached for allegedly having used 39 social security numbers; 2 birth names; one legal adopted name aka Barry Soetoro (Indonesia law requires students living in Indonesia to denounce their U.S. citizenship and accept Indonesian citizenship as Indonesia does not recognize dual citizenship); an alleged birth in Kenya as stated by Obama’s grandmother on video per Philip J. Berg, Esq. ; and an alleged birth in Hawaii; remain unchecked by the U.S. government? Under which constitutional authority is the government and federal judges denying due process of law in U.S. courts with the knowledge that Obama has remained improperly vetted. He swore a presidential oath to uphold the U.S. Constitution, preserve and protect the constitution, and Article II is constitutional law and the Rule of Law. How is it that his applications were approved by the DNC and never investigated by the U.S. Congress? How is it acceptable for public servants, who have knowledge that the vetting process was botched, refuse to correct the record and properly identify a candidate and now, a U.S. President, since it is their fiduciary duty to protect the welfare and safety of the American people? Remember, in 2008, Americans were told by Obama that his name is Barack Obama; then the news reported that his true name is Barack Hussein Obama, but the American people could not say the word Hussein – (Can you say H u s s e i n?). After election in 2009, Obama began boasting that his true name is Barack Hussein Obama. The first Lady stated that her husband was born in Hawaii, but his grandmother ended up on video stating she was present when Obama was born at a Kenyan hospital. Consequently, how do the historians correctly identify the current president when they set out to write the facts about the current U.S. President? After all, his records are sealed. Ironically, under Obama’s administration, business owners are being arrested, even though they are not law enforcement officers, if they fail to detect a fake ID and hire an illegal person. Obama and his administration are knowledgable that criminals use high-tech equipment making it extremely difficult for the average citizen to detect fake ID’s. After all, the government has failed to properly identify the President of the United States of America and he has refused to produce certified copies of his identity so that this serious matter can be resolved according to Article II, the supreme law of the land. In conclusion, Article II is an implied law. Article II implies that a U.S. President must prove his or her age and his or her birth place . The vetting process requires that he must provide places of residence, education, and employment as well as the organizations that he joined. For example, without a legal and valid U.S. social security number, and a valid U.S. birth certificate, how does the government know the true age of the current U.S. President as required by Article II, which requires that the candidate for president be 35 years of age. Although, he appears to be more than 35 years of age, his appearance is not proof of his age and the failure to provide such information violates Article II. The President of the United States of America is required by the constitution to perform a fiduciary duty that complies with the will of the majority of the American people, not congress! Our government is run by We The People and it is the fiduciary duty and sworn oath of every congressional member to uphold the Constitution of the United States for the protection of our country and the American people according to the will of the people. The American people are the government and not the servants of the government. Public Servants are provided jobs in exchange for compensation and benefits and they are required to perform those jobs according to the laws of the land and to the best of their ability. Public Servants have a fiduciary duty to use common sense, decency, and pass just and moral laws that comply with the will of the majority of Americans as well as remain within the boundaries of the constitution. Public Servants are compensated because Americans believe their “promises” which are “contracts” made in “Good Faith.” Promises made to the American people are legal contracts when more than one person witnesses the promises. It appears that the contract which Obama and Congress have made with America to-date continues to be violated as many public servants in power refuse to uphold Article II of the U.S. Constitution. **Note: Readers may share this article, but not change the content or use any part of this article as their own material and all Third Parties are prohibited from Plagiarizing this original Blog. After exploring a number of the articles on your site, I seriously like your way of writing a blog. I saved as a favorite it to my bookmark website list and will be checking back soon. Please visit my website as well and let me know how you feel. Did Obama Usurp the Constitution and Congressional Power To Declare War on Libya with the blessings of the Democratic Congress? Is the Actual Cost of Building a Tomahawk $1.4 million to U.S. Taxpayers x About 200 Fired At Libya? Are the Democrats Mad As Hell, yet?